Recently I taught a group of 12 and 13-year-old girls a church lesson about the importance of keeping a journal. (Excuse me while I climb on my soap box.) We have a great opportunity to share our lives with our children, our grandchildren, and generations beyond if we write down the thoughts and events of our lives. We won’t remember most details of even the most important times in our lives–we have to write it down, write our own stories. And it doesn’t only benefit posterity. It’s wonderful to be able to go back and see the important life lessons we’ve learned, blessings we’ve received, and truths manifested in our lives. Sometimes it’s hard to think of meaningful, interesting things to write, and this can quickly deter us from keeping a regular journal. To help these girls start on a regular journaling kick, I made them each a Journal Jar. Each day they can pull out a journaling prompt and write something about themselves. This would be a great summer project for kids old enough to write, but it’s also an important project we need to start for ourselves. 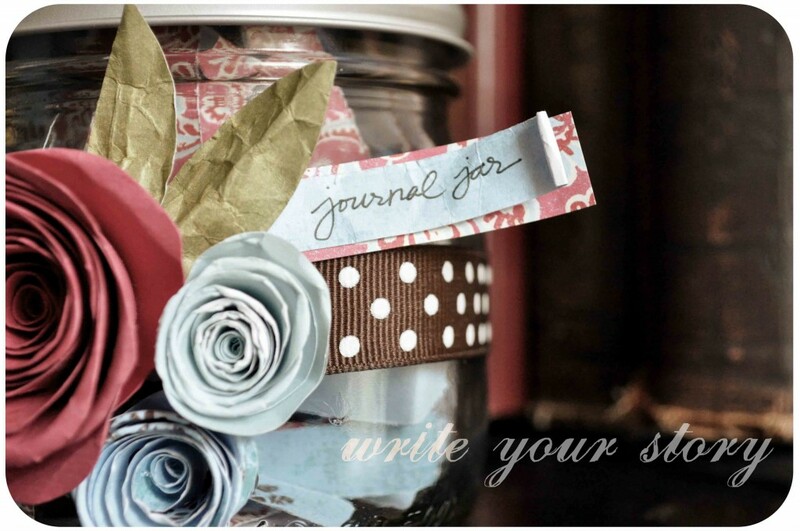 Put together one of these cute jars and you’ll instantly be inspired to keep a journal! First, gather journaling prompts from around the Internet or write your own. Some of my favorite were from Abundance Blog. I tweaked a few that sounded a little negative or too old for the girls, but most of them were interesting or thought provoking. Copy and paste the prompts into a Word document and change the font to something cute (optional–well, not for me). 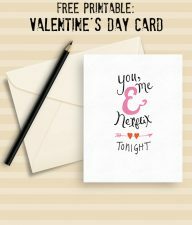 Print them on the white side of some one-sided patterned scrapbooking paper. Then cut them into strips, fold them in half, and stuff them in a canning jar. I love this shape of this one, but any glass jar would work wonderfully. 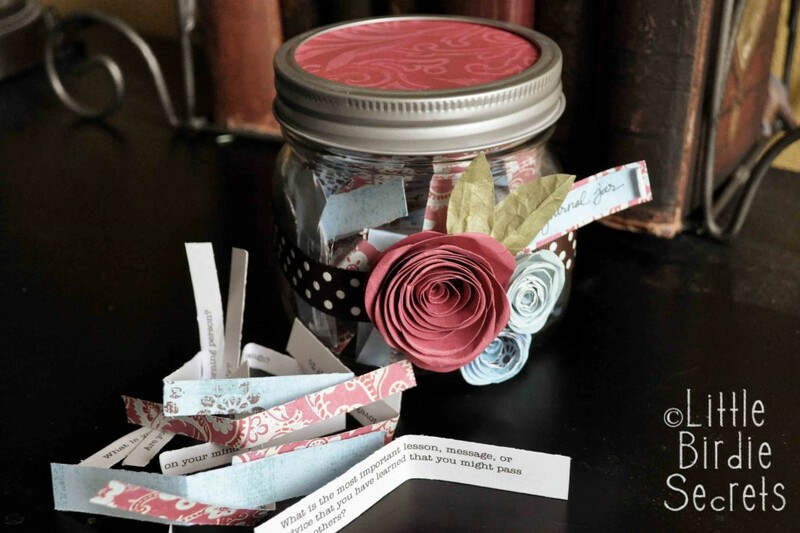 You can also print these on plain white paper, but I love the way the patterned paper adds some color to the jar. Next, trace the lid of the jar on some coordinating patterned paper. Cut it out and glue it to the top of the inner lid. Now it’s time to decorate your jar! 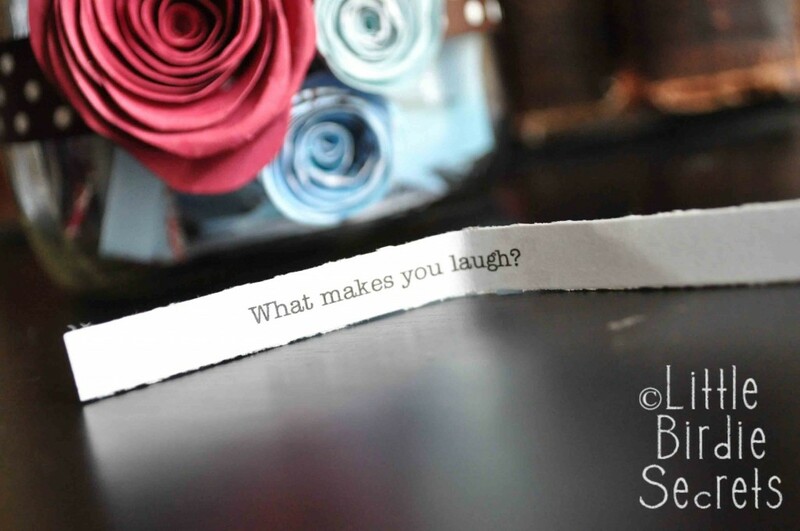 You can use ribbon, paper, or something more elaborate like my paper roses. I also included a tag that says Journal Jar. 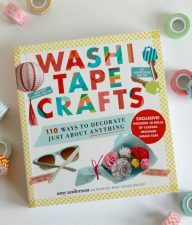 This would make a fun gift, along with a pretty journal, for a teenage girl, a sister, or a best friend. Or coordinate it with your bedroom decor and keep it on top of your journal for a cute nightstand accent! Little Birdie Secrets are regular contributors to Make and Takes and was born from the crafting obsession of three friends living in the Pacific Northwest. Our mission is to share the wealth of fun projects and helpful tips we find in books, on the Internet, and sometimes in our own imaginations. Come visit us at www. 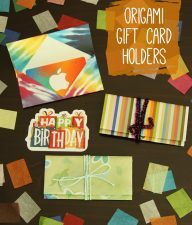 littlebirdiesecrets.com. I love this! 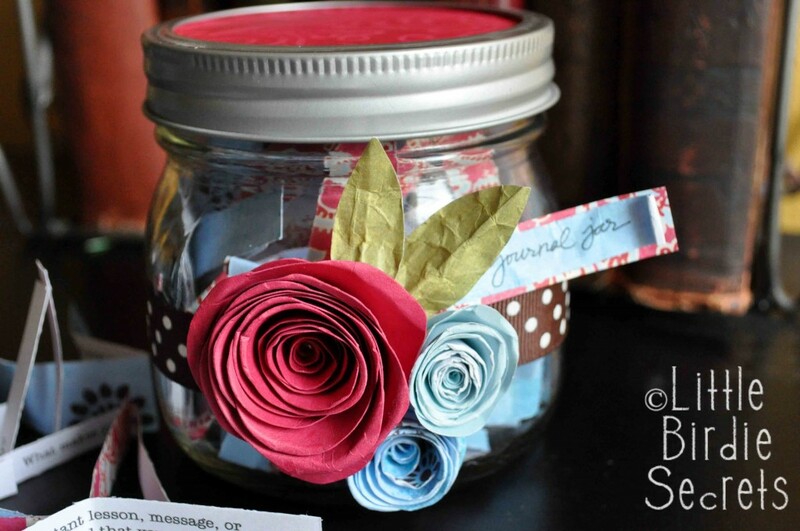 I watched your paper rose tutorial and want to make three roses like the ones you have on the jar…what size paper did you use for them? The 6 inch by 6 inch for the larger one? What about for the smaller? Thanks!!! This jar is too cute! I LOVE this idea!!!! I think I will make one for each of my girls! So sweet and special! 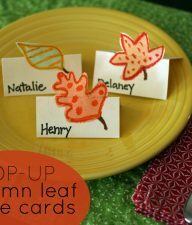 I love love love this idea – all of it! But I’m wondering how you could decorate the jar for boys and make it just as gorgeous? Any ideas? This is such a wonderful idea. I think I will make one for my daughter (she’s 13), and I also blogged about it. I’m bookmarking the Abundance Blog post for when I just can’t get started with a blog idea, etc. I absolutely love this idea! I think it would be such a great way to get girls to express themselves without forcing them to expose themselves more than they wish initially! I think I will make a couple of these great little jars, I have a Goddaughter turning 11 in a week. What a fun gift. Thanks so much for the excellent idea! This is such a wonderful idea!! I love journaling, and this makes it look like even more fun :) I agree with Sarah-what a precious way to record your thoughts and memories and pass them down to children and loved ones. Great post-thanks so much for sharing! Oh, you sneaky writer! You combined a great writing exercise with POLKA DOTS! Add the creative fonts and the flowers in a jar – and you have definitely sealed my fate! LOL! I cannot wait to do this! My littlest guy needs some writing development exercises. And my next one up enjoys writing. I LOVE THIS! – opps, I will put that lid back on the Composition Teacher within and leave! Thanks for the idea and tutorial. Great ideas! And those jars are so cute! I just made a goal last night to journal more often. Thanks for giving me another push! I have been journaling to my children…about their lives and what is important to me. I am amazed at what I wrote about my daughter’s Cardiac ICU experience-just 3 1/2 years ago-that I have already forgotten. Details are important! You can read about my journals at http://livelearnlove226.blogspot.com/2009/08/letters-for-future.html if you are interested. I love this idea. And those paper flowers are GORGEOUS! Almost prettier than the original!